There is no better way to offset the damaging consequences of an auto accident than getting an experienced personal injury attorney. We have a combined 48 years of experience handling Personal Injury and Workers' Compensation cases, which means we thoroughly understand the process. Our Miami workers' compensation lawyers have collected millions of dollars for our clients. What can we do for you? If we don't obtain a recovery, you will owe us no attorneys' fees. If you live in south Florida and you have recently been involved in an auto accident, there are important steps you should take immediately to secure your interests. You should take lots of pictures of the damage done to the vehicles, the location of the incident, and any injuries that you or your passengers sustained because of the accident to preserve evidence. You should also seek medical treatment for your injuries. 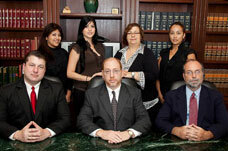 Above all, you should contact our Miami personal injury attorneys today. If you were injured at work, depending on the circumstances, you have the right to collect workers' compensation benefits from your employer. If you hire the attorneys at Bloom & Kinnear your case will be handled by experienced, competent Miami workers' compensation attorneys. If your employer has retaliated by firing you for filing a workers' compensation claim, speak with an attorney at Bloom & Kinnear; we have experience handling retaliations claims. We zealously represent our clients who have suffered wrongful termination or wrongful retaliatory discharge.